set the trail: trail setters: planting begins! Today marked the kick-off for our tomato starts' migration outdoors. My family was able to wheel barrow out several plants fairly earlier than last year's bunch due to the mild winter the Pacific Northwest has been having. 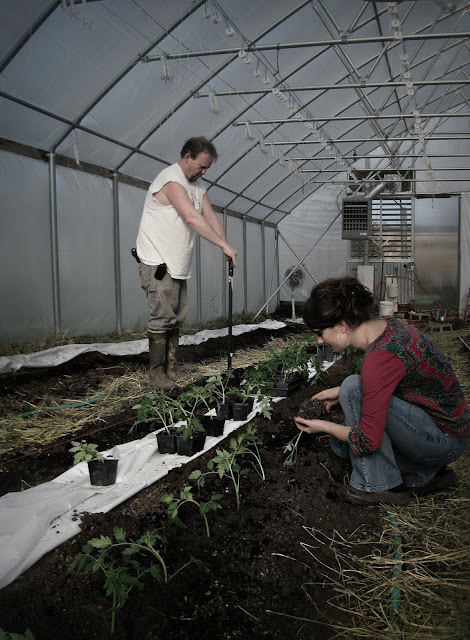 We filled the first greenhouse with six long rows of Trust Beefsteaks and shall be planting more tomatoes in the next few days and weeks, dependent on variety and start-size. Working as a team, my step-dad, Neil, used a bulb planter to create aligned holes for the tomatoes while my mom and I lovingly planted each start, gently covering each with a blanket of well-tilled soil and dark, rich compost. It was also quite warm in the greenhouse today with the sun shining overheard... almost 70 degrees Fahrenheit! This warmth, combined with the feeling of cool, moist dirt on my hands, the scent of tangy tomato plants and earthy alfalfa grass, and the sight of happy little earth worms squirming about...well, it certainly made for a good day. Hopefully this El Nino pattern sticks with us, These 50 degree nights help keep the propane bill down and just maybe we will get some big reds by the second week in May. Oh man! I've been wanting to get my sugar snap peas out. C'mon El Nino! This will be the first year we've had flowers on our peach trees, woo hoo!